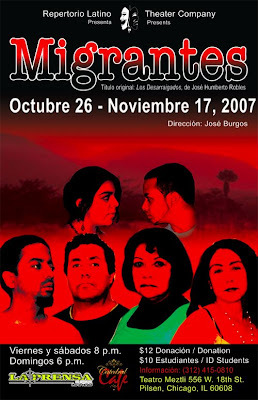 Repertorio Latino Theater Company is initiating its fall season with a production of Migrants, based on the popular work The Uprooted by Mexican playwright Jose Humberto Robles. The play is set in the 1950’s and tells the story of the Pacheco family who immigrates to the United States (Texas) from Mexico, fleeing from the social and political insecurity that plagued their country as a result of the Mexican Revolution at the beginning of the 20th century. But they pay a high price for the “security” they seek as they encounter a nation wrapped up in an imperial war that will kill several members of their family and convert their dreams into nightmares. They find themselves “living like a strange animal,” far from their home and immersed in a dominant culture that only values them as workers or soldiers for the war while treating them as second class citizens. Migrants will run from Friday, October 26 through Sunday, November 17 of 2007 . Performances will take place on Fridays and Saturdays at 8:00 pm and Sundays at 6:00 pm. This timely play features the talent of Sarahy Knapp, Danilo Duran, Carmen Cenko, Freddy Cerrato, Angie Martinez and Jose Burgos, who is also the director. "GRACIAS POR APOYAR AL TALENTO LATINO!!!"